The Aberfeldy and District Choir is to lead more than twenty other choirs on Saturday’s Grand Parade for the Massed Choirs event which will mark the closure of this year’s National Mod in Perth. The choirs will follow the Royal Mail Pipe Band from Thimblerow Car Park at 10.30am, and will go down the High Street into St John’s Street for the Massed Choirs singing outside St John’s Church. Joining them on the march will be pipe bands from Blairgowrie, Comrie, Kinross, and the Vale of Atholl juniors. Conductors of winning choirs will each take a turn at conducting the singers, and Perth and Kinross Provost Bob Scott, together with the Convenor of the Local Mod Committee Neil McLeod, will address the crowds. The Massed Choirs is a hugely popular event, and is enjoyed by participants and onlookers alike. Choir members wearing yellow jackets will act as stewards to ensure the smooth running of the occasion, and Tesco Extra are kindly providing soup and sandwiches to be served in the Lesser City Hall for all Mod participants after the closing event. 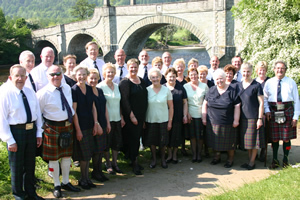 The Aberfeldy and District Choir is entering several top competitions, including the Lovat and Tullibardine Shield, the Puirt a Beul (mouth music), the Ladies’, as well as the quartets. Choir member Gilliain MacDonald, who recently swept the boards at the Lochgilphead Mod, will be going for gold in the soloist section.